Good Cheer’s innovative Food Bank is at the core of our mission. We provide healthful food — including fresh locally-grown produce — to an average of 850 families each month. We need your ongoing support. Our popular Thrift Stores provide affordable “pre-owned” merchandise to shoppers in convenient locations. Join us for enjoyable bargain hunting among friends. Your purchases are the greatest part of our financial support. We are very proud of the generous support we receive from our community. Won’t you please consider volunteering in our efforts? We also welcome your donations! Tues. Noon to 7 p.m.
Wed. to Sat. : 9:30 a.m. – 4:30 p.m.
Our today… Good Cheer sees partnerships with our community as keys to our ongoing success. A fine example of that effort has been our work to develop a network of community partners to provide healthful, locally-grown produce for our food bank clients. 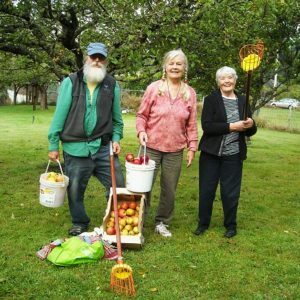 We’ve been working since 2008 with the South Whidbey School District, and subsequently with Whidbey Island farmers, agriculture apprentices, gleaners, and hundreds of volunteers eager to get their hands dirty for a good cause. As a result, in recent years we’ve been able to provide thousands of pounds of fresh fruits and vegetables in our Food Bank each year. Our Thrift Stores continue to attract eager customers from Whidbey Island, and from far-flung places. Our volunteers continue to inspire us with their energy. Our donors — individuals and corporate sponsors – continue their generous support. Our tomorrow... All of us at Good Cheer look forward to a bright future, continuing our work with our community. Please be a part of it today!